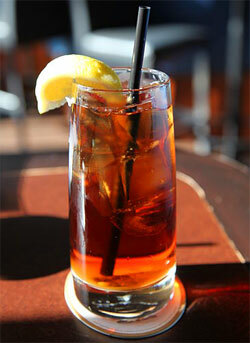 Whether or not you like drinking tea, a glass of iced tea is something altogether quite different. It is easy to make this drink in a matter of minutes, using this simple recipe, although you will need to allow enough time for the water to cool down first. If you are having a summer barbecue and the weather is hot, hot, hot, then cool yourself down with a jug of this very refreshing iced tea. It is simply a combination of stewed black tea (do not add milk to the recipe! ), lemon juice and sugar, as well as lots and lots of ice cubes. Iced tea has its origins in America, although there are now variations served all over the world, with Lipton's making the drink popular in the UK since the 2000s arrived. Many countries like to add some flavoured syrups to the drink, such as peach, raspberry and passion fruit, but we don't see the point! Boil a kettle containing around two cups of water and pour this into a large glass mixing bowl, together with the sugar. Add the tea bags and mix around, pressing and squeezing them with the spoon so that they properly stew, and stir well so that the sugar completely dissolves. Leave for five minutes and grab yourself the lemon. Wash the lemon and roll it on the worktop, to make it more juicy. Cut the lemon it half and squeeze all of the juice into your serving jug. Pour in the cold water and stir in the sugar. Remove the tea bags and allow your stewed mixture to cool down for around 20 minutes, before pouring this into the jug and filling it up to the top with ice cubes. Add a sprig of mint or two if you feel like being a bit of a fancy pants.